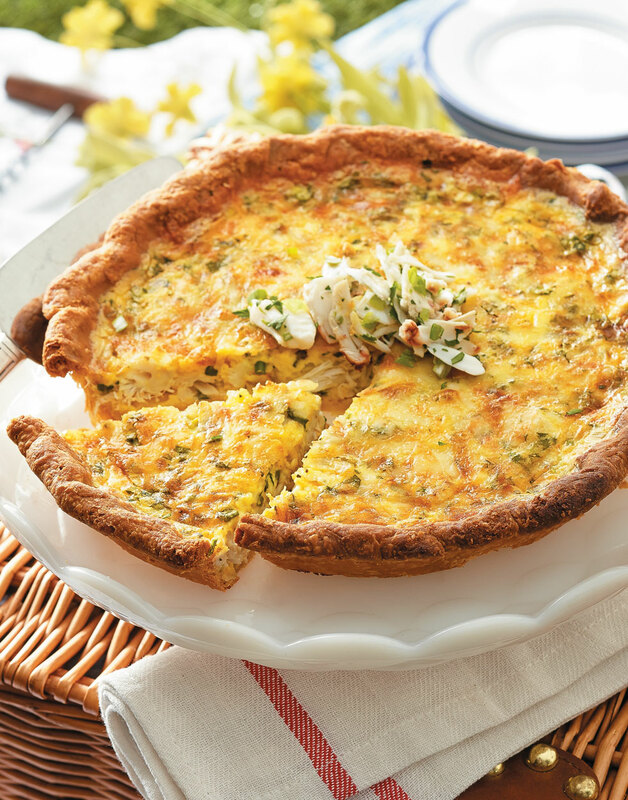 A rich and flavorful cream cheese crust takes a quintessentially French dish to new heights in this indulgent Crab & Scallion Quiche. Pasteurized crabmeat comes in three forms: lump, backfin, and claw. Any of the three will work for this quiche. Preheat oven to 400°. Coat a 9-inch pie plate with nonstick spray. For the crust, combine flour, sugar, and table salt in a food processor. Add butter and cream cheese and pulse until dough forms around the blade. Shape dough into a disk, wrap in plastic wrap, and refrigerate 30 minutes or overnight. Roll out dough on a lightly floured surface to ¼-inch thick. Transfer dough to prepared pie plate, then trim and crimp edges. Freeze pie shell until firm. Line shell with foil, weigh down with dried beans, and blind bake on a baking sheet, 25 minutes. Remove foil and beans and continue baking crust until golden, 10–15 minutes more. Reduce oven heat to 375°. For the filling, combine crabmeat, scallions, and parsley. For the custard, whisk together eggs, yolks, milk, cream, kosher salt, white pepper, Old Bay, nutmeg, and Tabasco. Fill crust with crabmeat mixture, then pour custard over top. Sprinkle Gruyère over filling. Bake quiche until filling is set and top is brown, about 30 minutes. Cool quiche on a rack 30 minutes before serving. Serve quiche warm or at room temperature.